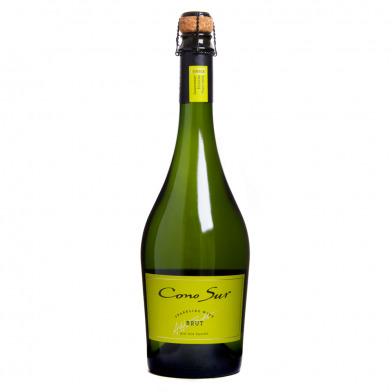 Cono Sur's Sparkling Brut is lively bright and complex with citric aromas and hints of green apples, white flowers with touches of honey and a slightly creamy finish. In the mouth it is juicy and crisp with a refreshing minerality. Pairing A balanced with of great acidity, this is the ideal aperitif and pairs wonderfully with seafood and salads. Cono Sur´s sparkling wines are lively and radiant, perfect examples of the vineyard´s innovative spirit. Each delicately selected grape comes from the Bío Bío Valley, one the world´s southernmost winemaking regions. Known for its sunny yet cold weather conditions, along with rich red soils, it is the perfect location for well-balanced, concentrated wines, with excellent acidity and splendid minerality.